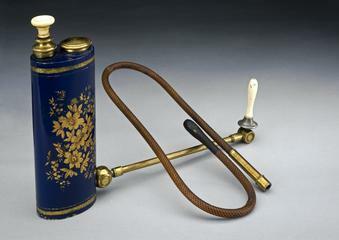 Japanned brass reservoir enema syringe, piston-action, by Weiss and Son, 62 Strand, London, England, 1823-1883. 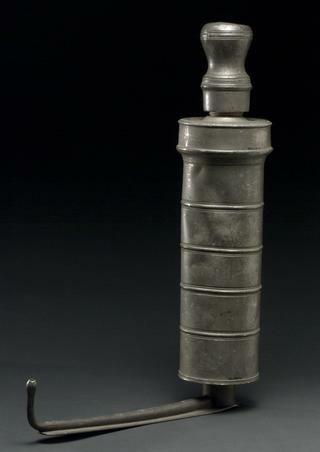 Pewter enema syringe, piston action, in wooden case, by James Thompson, 42 Great Windmill Street, London, England, 1817-1826. Japanned reservoir enema syringe, in case, Hornes's patent, by Philp and Whicker, 67 St. James's Street, London, England, 1850-1856. Japanned brass reservoir enema syringe, piston-action, by Weiss and Son, 62 Strand, London, England, 1847-1889. Pewter enema syringe, with three nozzles, piston action, in wooden case, by S. Maw, 11 Aldersgate Street, London, England, 1860-1870. Reservoir enema syringe, in wooden case, by J. and S. Maw, 11 Aldersgate Street, London, England, 1828-1860. Japanned metal reservoir enema syringe, piston action, by F. C. Rein, 108 Strand, London, England, 1851-1917. Resevoir enema syringe in wooden case, J. and S. Maw, 11 Aldersgate Street, London, England, 1828-1860. 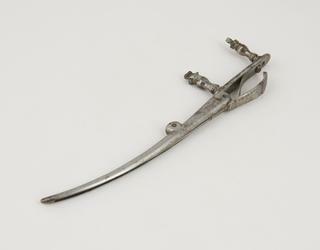 Reservoir enema syringe, piston action, by S. Maw and Son, 11 Aldersgate Street, London, England, 1860-1870.